Posted on Tuesday, May 27th, 2014 at 3:29 pm. 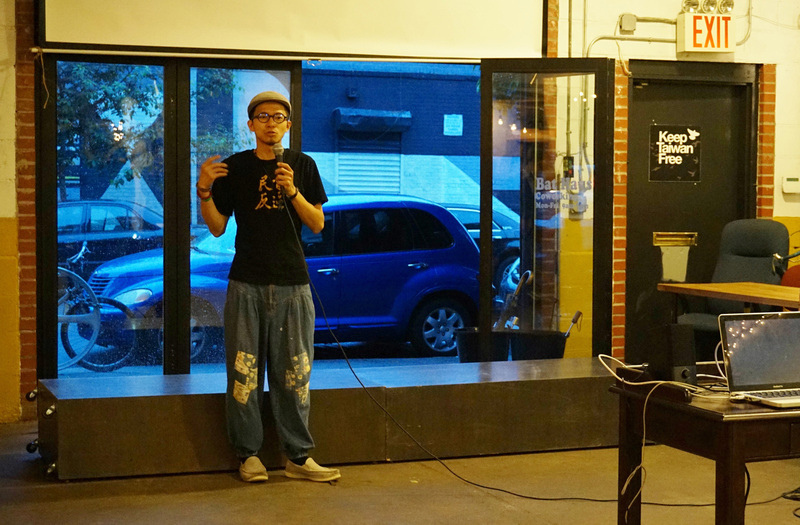 On a damp New York evening on May 22, just a stone throw away from Bushwick Collective on Troutman Street – a street filled with graffiti murals turned into an art gallery of sorts, the open-air Bat Haus Coworking Space was abuzz with artsy hipster types. 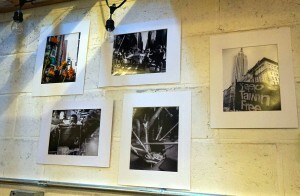 They were holding Brooklyn Brewery beers and admiring photographs and paintings of sunflowers. 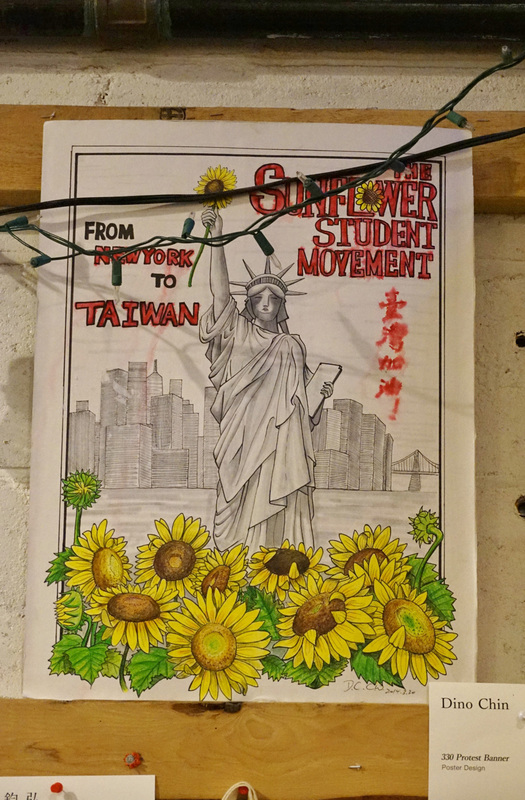 Speaking in Mandarin with a smattering of English, the attendees, mostly young people in their 20s and 30s, were discussing the role of protest art in Taiwan’s Sunflower Movement. 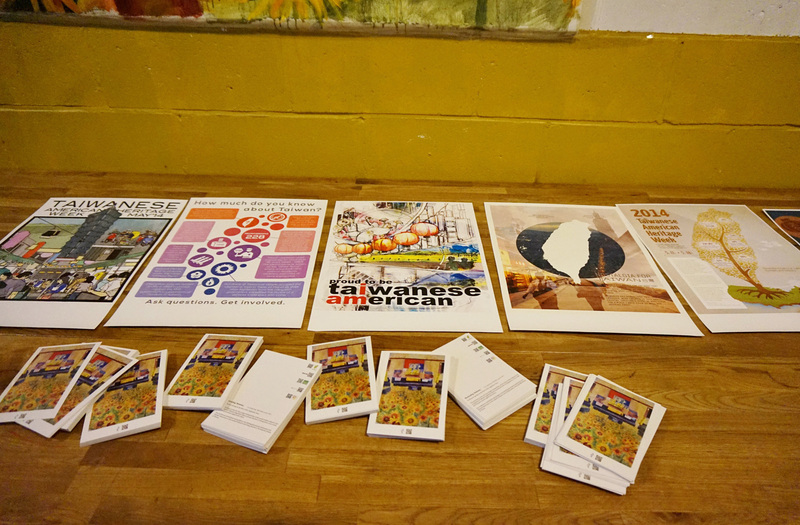 Organized by the Taiwanese American Association of New York (TAA-NY), the Formosan Association of Public Affairs (FAPA) and Taiwan Not For Sale, the “Art for Advocacy” exhibition was a visual commemoration of the three and a half week occupation of the Legislative Yuan in Taipei, Taiwan from March 18 to April 10. 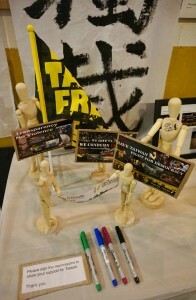 During this time, occupiers protested against the Cross-Strait Service Trade Agreement between Taiwan and China. 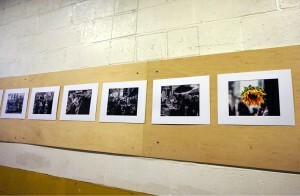 The layout of the exhibition reflected this dual purpose. 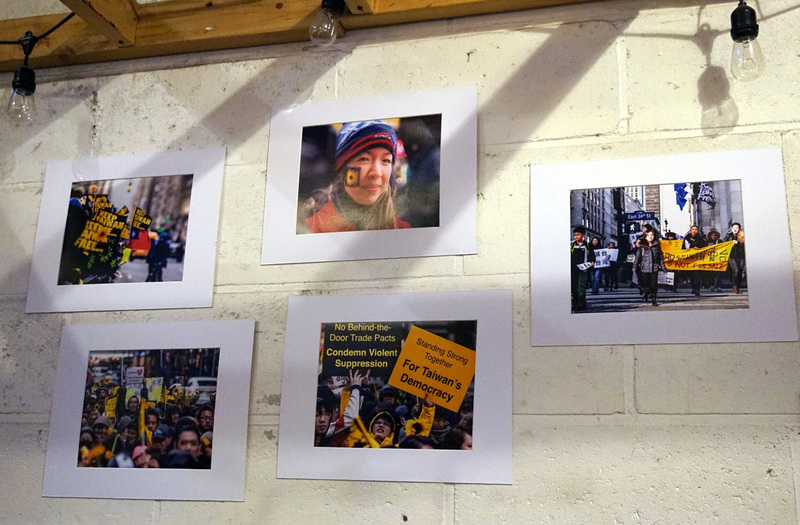 Protest art from Taiwan was displayed alongside photographs and posters produced by overseas Taiwanese in New York during the March 30 protest in Times Square. 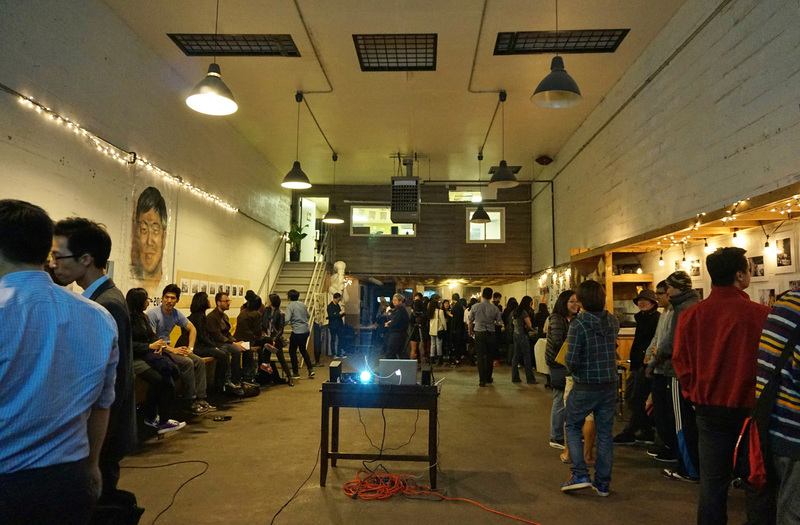 Tying it all together was the theme of challenging the boundaries of art and liberating art from traditional museums by bringing it to public spaces. 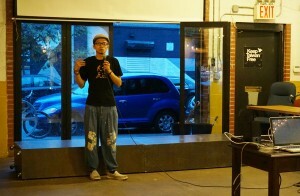 The feature guest of the night was Liu Tsung-jung (劉宗榮), a young artist from Taipei who occupied the Legislative Yuan where he made paintings for other protestors. 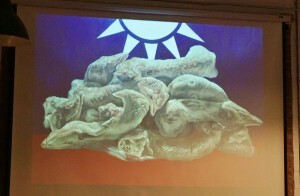 Liu said that he had been involved with social movements in Taiwan for many years. 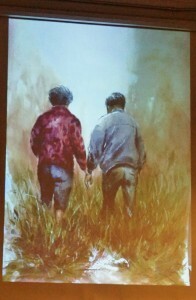 He brought with him two of his most prized paintings. 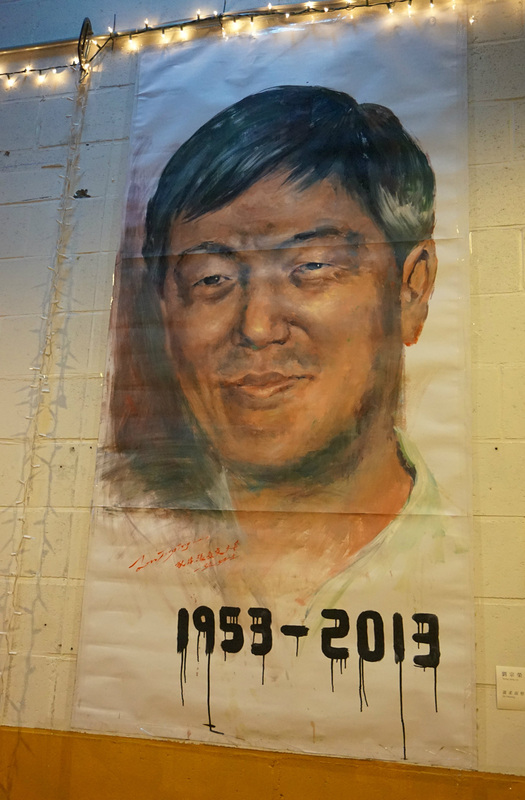 The first was an oil-base portrait of Chang Sen-wen (張森文), a man who was found dead in September 2013 after the Miaoli County government forcibly expropriated his land and demolished his house and pharmacy. 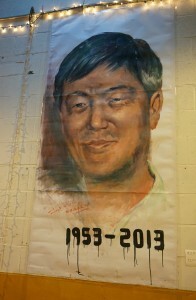 Liu had painted the portrait for Mr. Chang’s funeral. The second piece of artwork was Liu’s acrylic painting of a sunflower field inside the floor of the Legislative Yuan entitled “Illuminating Darkness”. 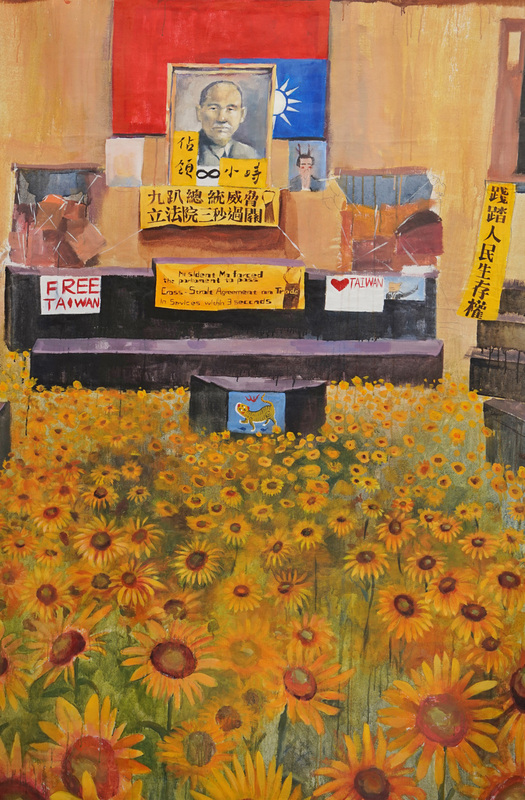 From the upside-down Taiwan flag to the painting of President Ma Ying-jeou (馬英九) with antlers, “Illuminating Darkness” captures the dark days of the occupation, while the sunflowers evoke a cheerful feeling. “The sunflowers symbolize casting light to the existing government institutions and Taiwan’s democracy” Liu explained. 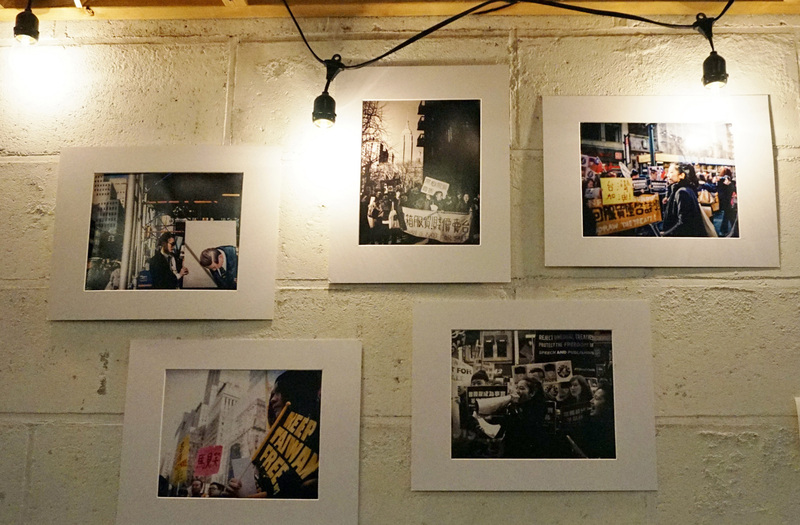 In addition to Liu’s artwork, there was also photography from the March 30 Times Square protest by Chiu Yu-chen (邱于真), Hsieh Meng-Ling (謝孟伶), Ku Sinru (古欣茹) and Chris Nicodemo. 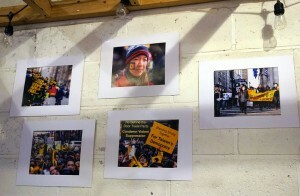 A couple of protest banners and posters from March 30 were also on display. 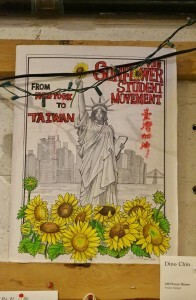 Notable ones included Dino Chin’s drawing of the Statue of Liberty standing behind a row of sunflowers. 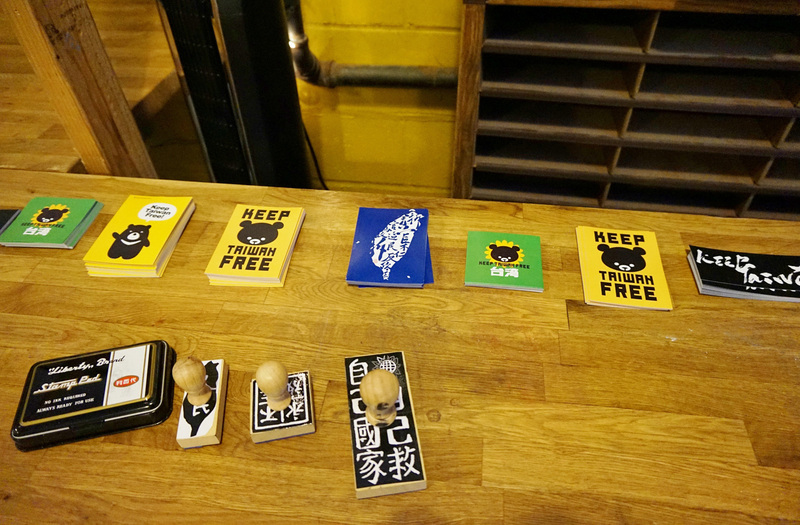 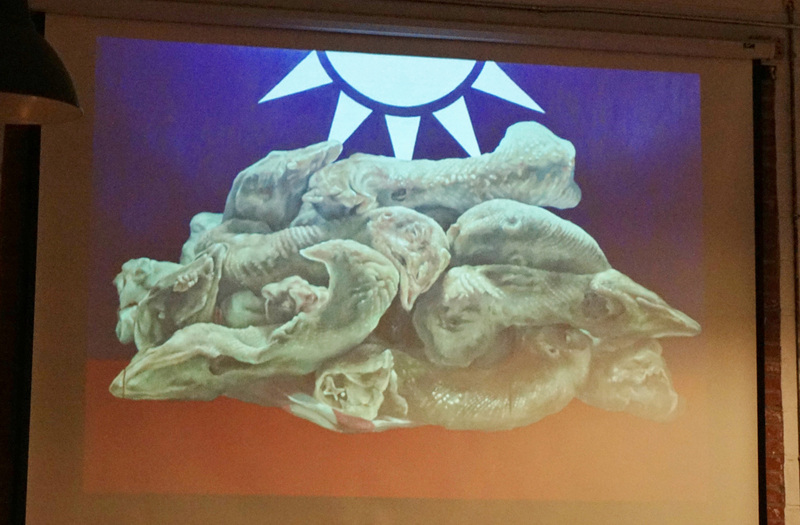 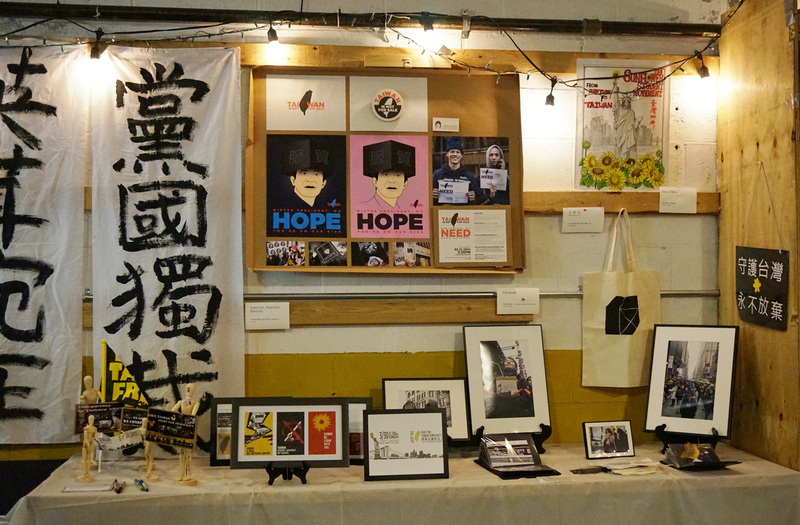 Protest art from the Taiwan Not For Sale team also featured prominently – this included protest banners created by Camy Lee, Seray Sun and Kitty Lim, along with Chiu Chiung-hui’s (邱瓊慧) poster design depicting President Ma’s head inside of a black box. 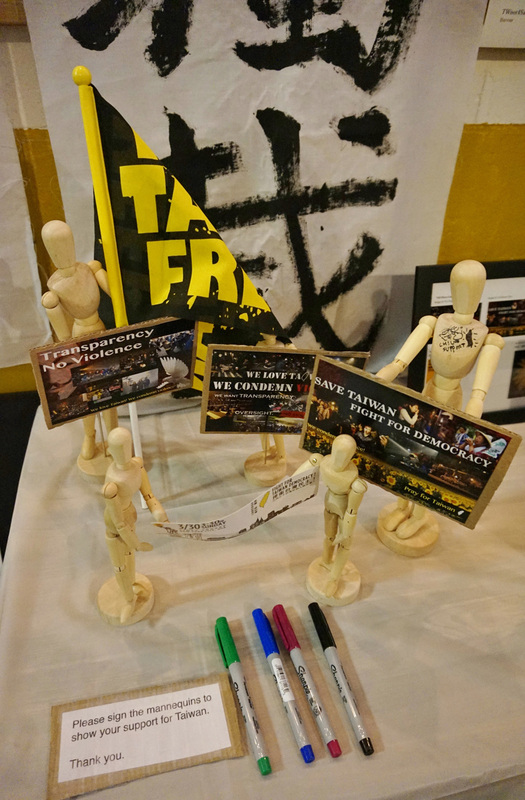 “There’s such little time to prepare protest art, so it needs to be creative, funny and witty,” said Kay Chen, a young Taiwanese activist who helped to organize the march from the Taipei Economic and Cultural Office (TECO) to Union Square on March 21 and the Times Square rally on March 30. 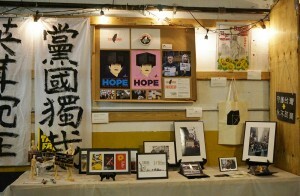 Other types of artwork were also showcased. 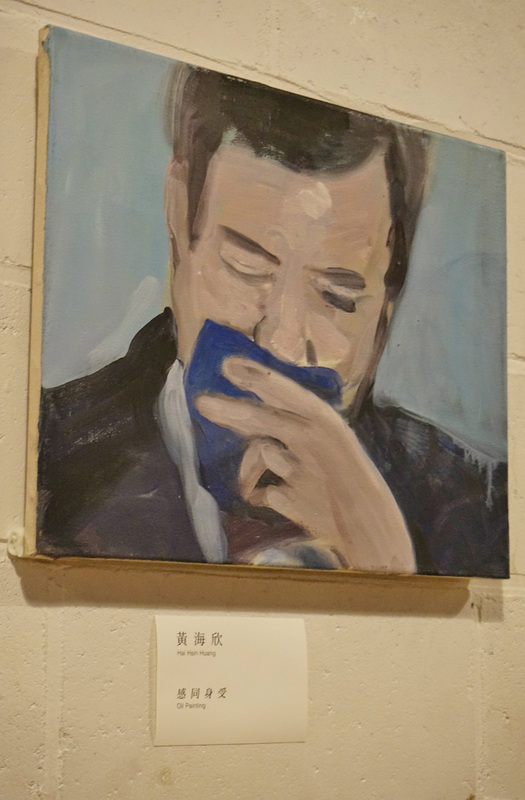 Some were mellow and reflective like Huang Hai-hsin’s (黄海欣) oil painting of President Ma with a blue handkerchief. 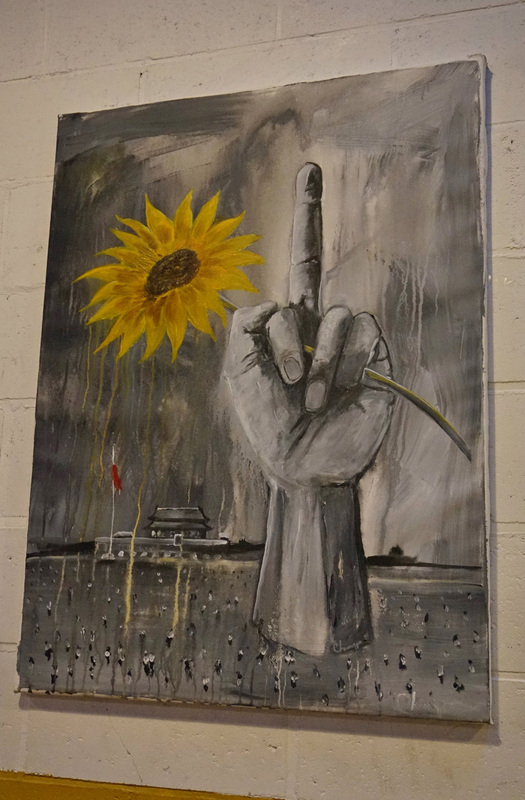 Whereas others like Tibetan artist Dawa’s (達瓦) “I Am Ai Weiwei” depicting a gray hand clutching a single sunflower with its middle finger in the air, were more political in nature. 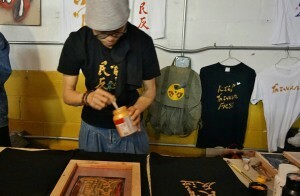 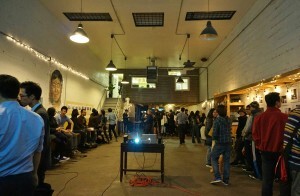 Liu’s screen-printing demo was the perfect end to a casual yet informative evening. Attendees trickled out of the Bat Haus Coworking Space with their names printed on t-shirts and their bags stuffed with “Keep Taiwan Free” stickers – cute but powerful reminders to keep the Sunflower Movement alive. 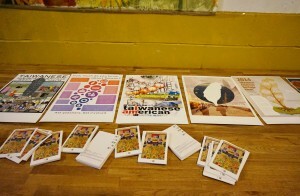 Dana Ter is a New York City-based writer/reporter who has lived in 10 countries on 4 continents. 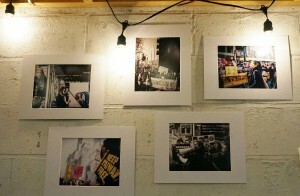 Her writings on the arts, culture, film, music and entertainment has been published in the Taipei Times, PolicyMic, Untapped Cities and more. She has a Dual MA/MSc from Columbia University and the London School of Economics and links to her published articles can be found on her website.